In a previous session, we built a “CD Simple” example app, to learn about Core Data. Today, we move beyond read-only, and look at adding and editing. We will also use multiple entities, and multiple navigation levels and paths. This post was most recently updated in October 2011. As you know, the window- and navigation-based application templates both offer you the choice to use Core Data. Which one should you start with? Choice 1: Start with a window-based application template. That way, we won’t have to un-do some of the functionality in the navigation-based application template. However, we’ll have to build in the navigation functionality. Choice 2: Start with a navigation-based template. This template is built for table view navigation, and works out-of-the-box. We will have to un-do some of the functionality. This choice is suitable when the root view controller is a table view (which gets its data from the Core Data store). The choice is up to you. For most projects, we’ll use the navigation-based application template. Today’s application is based on the School of Information and Communications Technology (formerly Computer Studies) curriculum plan app (Nav SCS) from last week. We’ll implement it as a Core Data based app, and add data editing functionality. Here are some screen captures. Programs list, view, and edit: Home screen, showing a list of Computer Studies programs. Then, the blue disclosure button is tapped, to show more detail about the BSD program. Finally, the Edit button is tapped to show a screen that enables data editing. Programs list editing (i.e. delete): Home screen, tap Edit, tap one of the ready-to-delete buttons. Programs list, add new program: Home screen, tap Edit, tap + (the plus sign); ready to add a new program. Tap a program, view course list, view and edit: Home screen, tap a program to view the course list, tap a course to see its details, tap Edit to get ready to edit the course details. Delete a course: Home screen, tap a program to view the course list. Tap Edit to see the ready-to-delete buttons, tap a button. Add a course: Home screen, tap a program to view the course list. Tap Edit. Then, tap + (the plus sign); ready to add a new course. The full-featured complete example app, called “CD Complete”, is in the downloads area. The purpose of this app is to provide you with a template that you can use to create a navigation-based application that uses Core Data. You want to be able to do this reliably and predictably. Let’s look at the app design principles. Each of these functions becomes a check-box item on your “coding tasks list”. You should be able to perform each coding task in a predictable way, so that the function is added correctly, and works reliably. From our previous work with navigation-based applications, we have learned that we configure the view controller with the data and behaviour it needs. We continue this pattern. Incidentally… is there another way to do this? Yes. Create a custom initializer, which takes the data as an additional argument. If you drill down from one table view to another table view (i.e. one table view pushes another on to the navigation stack), then you need to pass along the selected managed object. Alternatively, if you drill down from one table view to a standard view controller (that shows details about the tapped item on its view), then you need to pass along the selected managed object. Create a new fetched results controller for each table view in your navigation scheme. Configure a fetched results controller delegate (typically the same subclass that contains the code that creates the fetched results controller; typically the table view controller subclass). It will enable your app to reliably respond to changes in the managed object context. If the user taps the detail disclosure button, they want detail about the item. 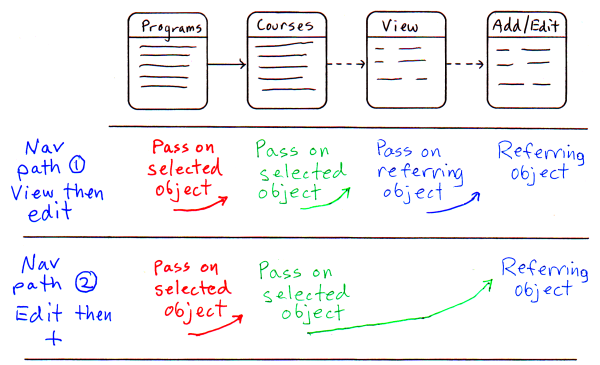 The managed object – the SO (selected object) – that backs the tapped row is passed to the “View” standard view controller, where it is known as the RO (referring object). How do we create a new course, which is related to a program? When you create your managed object model, we recommend that your relationships are defined both ways. With our model here, the Program entity has a “to-many” relationship with Subject. We also configure subject with the inverse to this relationship, so that it has a “to-one” relationship with Program. When you do this, setting one of the relations causes the inverse relation to be configured with no additional work by you. This means that we can, for example, create a new Subject managed object, and set its relationship property to the Program managed object that it is related to. A program row is tapped. The Programs table view controller passes on the selected Program managed object that backs the tapped row, to the CourseList table view controller. Then, a course row is tapped. 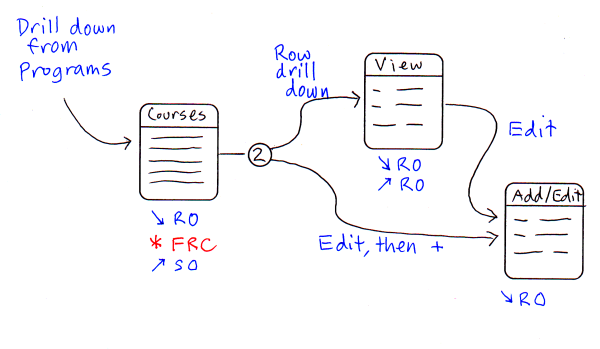 The CourseList table view controller passes on the selected Subject managed object that backs the tapped row, to the “course view” view controller. Finally, this object is passed on to the add/edit view controller. As above, a program row is tapped. Then, a new managed object is created, and its “program” relation is set to the passed-on referring object from the Programs view controller. Finally, the new managed object is passed on to the add/edit view controller. This app supports both navigation and data entry and editing. Therefore, we had to carefully think about the navigation bar configuration, so that it supported these functions smoothly. For example, some examples “out there” (e.g. Apple’s Core Data Books) are inconsistent about the use of the navigation bar. Sometimes, in navigation-enabled contexts, the back button is replaced by an edit, done, or + button. In other examples, you have to click a button on the right side to edit in one context, but elsewhere in the app, you have to click a button on the left side to edit in another context. We wanted to avoid these problems here. Therefore, we kept the edit button on the right side of the navigation bar. The only context in which it gets replaced is during the editing operation, where the button changes to “Done” (which makes sense in this context, as it is a toggle between Edit and Done). During the editing operation, the left button is “Cancel” (which also makes sense, because you can’t navigate while editing). The left button was reserved for the back button during navigation operations. During editing operations, it is replaced by a + button (to add a new item), or a Cancel button (during editing). Now, it’s time to build the application. We suggest that you re-create your own application, and use the provided sample app as a reference. All subclasses have been // liberally commented. Follow along below. Test your work (by running it) as you create your app. Use the navigation-based application template, with Core Data. The project starts with an app delegate and a root view controller. It also has a window nib, and a root view controller nib. You can run the application, and it will work. After you do this, delete it from your iPhone Simulator, so that you don’t get error messages after you change the data model in the next step. The app delegate doesn’t get any changes at this point in time – it’s good to go. The existing entity is useless to us, so we’ll just delete it. The first entity that we’ll create is the Program entity, representing one of the School of Computer Studies degree, diploma, or certificate programs. Please note that you cannot use “name”, “self”, or “description” as the name of the attribute. The Core Data Programming Guide says that “a property name cannot be the same as any no-parameter method name of NSObject or NSManagedObject [or NSPropertyDescription]”. The next entity that we’ll create is the Subject entity, representing one of the subjects (courses) in a program. Program and Subject will have a bi-directional relationship. Note that in real life, the Subject-to-Program relationship could be “to-many” (i.e. a course like EAC150 could be part of many programs). However, for this application, it will be a “to-one” relationship to keep it simple and to clarify the concept. For complete details about the optional/required, type, and default values of the properties, see the sample app. viewDidLoad hasn’t changed much. We left the button-initializing code there. We implement an override to setEditing:animated. Normally, if you place an editButtonItem on the navigation bar, the default implementation of this method takes care of toggling the button state between Edit and Done. However, we want custom behaviour – we also want a + button to appear if we’re in edit mode. Therefore, we have to override the method. Note that all overrides should call super (with its normal signature) before doing other operations. The fetched results controller gets created here. We have made a minor change to the template’s version – we added another sort descriptor. This piece of goodness will enable us to use the table view “grouped” view. We will sort first by “credential” – degree, diploma, certificate. Then, we’ll sort by program “code” – CPA, CPD, etc. When displayed in a grouped table view, we’ll get the nice separations you see in the screen captures. The insertNewObject template method has been changed. It now follows the standard “navigation-based application” pattern, where we create an instance of a next-level view controller, configure it, and push it onto the navigation stack. One of its configuration tasks is to set navigation bar buttons. We do it here, rather than in the next-level view controller’s viewDidLoad method. We have also implemented a fetched results controller delegate method. Of the four methods that we could implement, we have decided on the simplest – controllerDidChangeContent. This is ideally suited for situations like ours – a data source change happens, we need the table reloaded, and we don’t allow user-initiated row reordering. Most of these are similar to past examples, except that Core Data makes some things a bit easier (even though some of the concepts require a bit more abstract thought). In tableView:cellForRowAtIndexPath, notice the additional cell configuration. We can use cell.detailTextLabel.text because the cell was initialized with the UITableViewCellStyleSubtitle style. In tableView:didSelectRowAtIndexPath:indexPath, the typical pattern is followed – create, configure, push. Remember the guideline above: If you are navigating to a next-level table view controller, pass along the managed object, which includes the managed object context as a property. The context is needed there by the fetched results controller creator method. The tableView:titleForHeaderInSection:section method is called (by the view loading nib code) once per section, and it asks the fetched results controller for the text to be displayed as a section group header. In tableView:accessoryButtonTappedForRowWithIndexPath:indexPath, we do a typical next-level navigation operation. Here we are navigating to a detail view, and not a table view controller. In tableView:commitEditingStyle:editingStyle:forRowAtIndexPath:indexPath, we handle the request to delete a row. You may note that it doesn’t have any code to reload the table view, which is necessary after a row gets deleted. How does the table view get reloaded? The fetched results controller listens for changes in the managed object context. If there’s a change, it notifies the delegate. In our case, it is this class. The controllerDidChangeContent method runs (which reloads the table view). Above, we saw how the existing template logic enables us to quickly generate new objects. Here, we will create a view controller that enables the user to enter all details for a new Program. Before continuing, notice that the managed object model has reasonable initial values for each attribute. This fact may make getting started on your code a bit easier. Our “version 1” view controller will be called “ProgramEdit”. We’ll use it now to add new programs, and later to enable editing of an existing program. Reminder: This view controller will get pushed by the parent when a user taps Edit then + (to add a new program). The organization of this subclass’ methods is as follows. Its organization is simpler than that of a UITableViewController subclass. viewDidLoad is important here. While today’s sample app is working fully, your initial version won’t have to determine whether we’re adding a new program, or editing an existing one. So, until later, we need to focus only on the cancel and save methods. The cancel method will simply 1) delete the managed object that was added to the context by the parent view controller, and 2) navigate back to the parent by “popping”. The save method takes the user-entered data and places the values into the new managed object. Then, the context is saved. credentialSelected: is a simple helper method that configures the interface to ensure correct data entry. For example, a “certificate” credential has only 2 semesters, whereas a “diploma” credential can have 4 or 6 semesters. Now, we’re interested in a standard view controller that will use mostly UILabel controls to display the details of an existing program. This view controller is pushed by the parent in the tableView:accessoryButtonTappedForRowWithIndexPath:indexPath method. viewWillAppear does most of the work, by displaying the program’s details in UILabel controls. We want our code here, rather than in viewDidLoad, to avoid caching problems (viewDidLoad may not run if there’s no memory pressure). The only other bit of functionality will be to add a method that will handle the navigation bar’s Edit button tap. We’ll want to do a standard create-configure-push navigation to the ProgramEdit view controller we just created above. When we do, we’ll configure the new view controller instance with the managed object we are focused on. We just configured the above view controller to push ProgramEdit. So, let’s edit ProgramEdit, in viewDidLoad, to determine whether the managed object passed to it is new or existing. If it’s existing, then we’ll configure the user interface with its attribute values. selectedObject then gets assigned to the next-level view controller before pushing. Notice that we do NOT release selectedObject. This is because we don’t own it – don’t release what you don’t own (via alloc init). At this point, the app’s components that deal with programs have been configured, and should be working well. Now it’s time to add the components that deal with courses. If the user taps anywhere on a row, they want detail about the item. The managed object that backs the tapped row is passed to the “View” standard view controller. This predicate checks whether the value of the key attributeName is the same as the value of the object %@ that is supplied at runtime as an argument to predicateWithFormat:. Note that %@ can be a placeholder for any object whose description is valid in the predicate, such as an instance of NSDate, NSNumber, NSDecimalNumber, orNSString. The Predicates Programming Guide has a “Format String Summary” in the “Creating Predicates” section, starting at the bottom of page 12 (2010-06-14 PDF version). Any object? How about the selected “Program” managed object? Yes. Check the CourseList.m for details. This has been a lengthy process. However, we hope that you see how it results in a set of repeatable tasks, which enable you to approach the design and coding of YOUR application in a structured and predictable way. If you have any corrections, or if you find any bugs, let me know (via the comments), and I’ll take care of them. Noticed that the 1 to 1 relationship of Subject to Program is name “programS”, wouldn’t be better named “program” to be consistent with it being a 1 to 1 relationship. Yes, you’re right. When I originally created this example, I was going to support to-many relationships on both sides (e.g. a specific subject could be a part of more than one program). However, during coding, I scaled back the scope, mostly for clarity and focus. However, I didn’t go back and change the relationship name, but I should have. In the next re-write of this app, I plan to fix that. Do you have any example code, I am trying to add data to a table and cannot figure ti out. That code example series is now obsolete. If you follow the “iOS programming code examples” link, you will see the current code examples. There are several in the Week 5 and 6 area that begin with “CD…”. Those are the current ones. They are well-commented, and hopefully you’ll be able to follow them. The biggest change is that all the Core Data code was removed from the controllers. (Instead, you find it in the model, and in a “CDStack” class.) This is a better and cleaner design.